Russia and China have vetoed a UN Security Council proposal that would have banned the supply of helicopters to the Syrian government, and blacklisted eleven Syrian military commanders over allegations of toxic gas attacks. The proposed resolution, put forward by Britain, France and the United States, was put to the vote of the international body on Tuesday despite an earlier pledge by Russia to use its power the quash the proposal, the seventh time it has done so since the conflict first erupted in Syria since 2011. 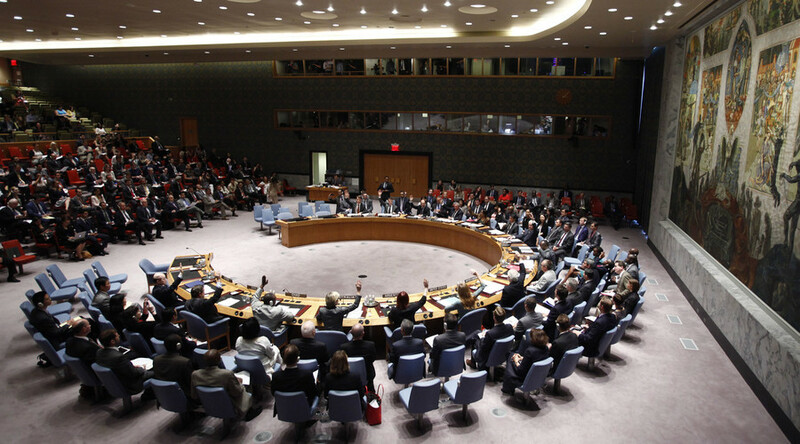 The nations behind the proposal criticized Russia and China for the veto. Russia’s Deputy UN Ambassador Vladimir Safronkov contended that the Western powers’ proposal was not supported by solid evidence. “The problem is that the basis of expert work on Syria come from dubious information submitted by the armed opposition, international NGOs sympathetic to it, the media and so-called ‘Friends of Syria’,” he argued. “The co-sponsors [of the proposal] have chosen and odious and erroneous concept, which is totally unacceptable. The fact that the resolution wasn’t supported by six of the fifteen security council members should make the co-sponsors seriously think,” Safronkov said. Bolivia voted against the text, while Ethiopia, Egypt and Kazakhstan abstained, according to Reuters. Speaking from the Kyrgyz capital Bishkek earlier on Tuesday, Russian President Vladimir Putin said that Russia considers it unnecessary to impose any more penalties against the government of Bashar al-Assad. While the sanctions were being debated, a new round of UN-sponsored Syria peace talks between the warring sides kicked off in Geneva last week. Saying that he is not expecting a breakthrough, UN envoy Staffan de Mistura said he was nonetheless determined not to lose the momentum towards a resolution. Although the liberation of the city of Aleppo and the loss of key territories by Islamist rebels have tipped the balance in the Syrian conflict, potential disagreements could arise over the opposition’s continued insistence that the fate of the Syrian government of President Bashar Assad be settled as a precondition – something that is not currently on the table. Russia announced that it has asked the Syrian government to halt all military operations for the duration of the talks, while other countries were expected to deliver the same message to the rebels. The last round of the Geneva talks was broken off nine months ago amid a sharp escalation in hostilities. Bashar al-Jaafari, the Syrian government’s negotiator at the Geneva talks, warned on Saturday that Damascus will view opposition groups that refuse to condemn the deadly suicides attacks in Homs as accomplices of terrorists. At least 50 people were killed and 24 others were injured in six suicide bombings outside military facilities in the city of Homs on Saturday, SANA news agency reported, citing Syria’s Foreign Ministry. Al-Nusra Front terrorist group, which renamed itself Jabhat Fateh al-Sham, has claimed responsibility for the attack.